I guess that every generation has its own events which raise conspiracy theories. For the generation before mine, it was the assassination of John F. Kennedy. (And I suppose, for some, the moon landing.) For Millennials, I would venture that those who were suspicious about the events of September 11, 2001, may have dabbled in searching for a conspiracy. For my generation, a conspiracy which comes up from time-to-time are the questions surrounding the death of Kurt Cobain. While it appeared to be a suicide by a depressed drug addict, there was always an air of uncertainty surrounding this conclusion. The new documentary Soaked In Bleach peels back the covers on this idea and brings a lot of information to light. On April 5, 1994, Kurt Cobain, the singer and guitarist for the band Nirvana died in his Seattle, Washington home. He was 27 years old. Cobain had a well-documented history of heroin use and much of his behavior implied that he suffered from depression. He died of a gunshot wound and was found holding a shotgun, so the official cause of death was suicide. It seemed like a very open-and-shut case, and the Seattle Police Department did very little investigating. Most member of the media accepted this story and Nirvana's fans were more concerned with mourning for their lost hero then in looking deeper into the suicide explanation. The film Soaked In Bleach (whose title is taken from a Nirvana lyric) looks to reopen the case in the court of public opinion. The film focuses on Tom Grant, a private investigator who was hired by Courtney Love, Cobain's wife, to help find Cobain, who had disappeared after leaving a Los Angeles rehab clinic. Grant recorded every conversation which he had with Love, and we hear many of these recordings in the film. According to Grant, Love's behavior was very suspicious and she seemed more concerned with her public image and with spreading rumors than with actually finding her husband. Grant traveled to Seattle to look for clues and later learned that Love had withheld information from him. Once Cobain's body was found, Grant's missing-person case suddenly became a death investigation. Grant reviewed the suicide note, interviewed Cobain's lawyer, and decided that the whole thing didn't add up. However, the Seattle Police refused to cooperate with Grant. The success of Statler's approach will depend on the individual viewer. While the scenes are well-staged and the acting is good, I can easily see how some could find these scenes somewhat silly. Also, some may be distracted by the actress who plays Love (Sarah Scott), because A) they'll be trying to decide if she's doing a good job of portraying Love and B) because she's more attractive than Love. Personally, once I got used to the fact that Soaked In Bleach was going to present these scenes, I didn't mind them, as they were certainly more interesting then simply sitting and listening to an audio recording for minutes on end. The most interesting thing about Statler's film are the conclusions which it makes and doesn't make. The movie introduce the idea that Cobain may have been murdered, or at the least, that someone else was with him when he died, but it does not point the finger at any one person and blame them for this. Instead, it simply introduces many, many inconsistencies in the stories which have been circulated about the last days of Cobain's life and his death, such as his desire for a divorce or the fact that the suicide note doesn't match his handwriting. The movie is simply stating that the case should be re-opened and it's difficult to argue with the evidence put forth here, especially grant's recordings. The movie also features a brief overview of Nirvana, although it does not contain any music from the band. 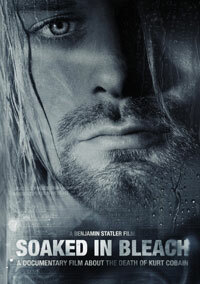 As a Nirvana fan, and someone who was shocked by Cobain's death, I found Soaked In Bleach to be a captivating movie and it certainly held my attention more than the overly-praised Montage of Heck. Soaked In Bleach did nothing to improve my opinion of Courtney Love on DVD courtesy of MVD Visual. The film has been letterboxed at 2.35:1 and the transfer is enhanced for 16 x 9 TVs. The image is sharp and clear, showing no distracting grain and no defects from the source materials. Keep in mind that we have a variety of elements here, and some of the archive interviews and news footage does look a bit rough. The modern interviews and dramatic scenes look fine, but they are a tad dark at times. The level of detail is good and the image is rarely soft. The DVD carries a Dolby Digital 5.1 audio track which provides clear dialogue and sound effects. The soundtrack sounds fine and we get some occasional snatches of music from the rear speakers. Otherwise, most of the audio is confined to the center channel, with the front speakers joining in every now and then. There are no extra features on the Soaked in Bleach DVD.